Having an Easter egg hunt in your garden? 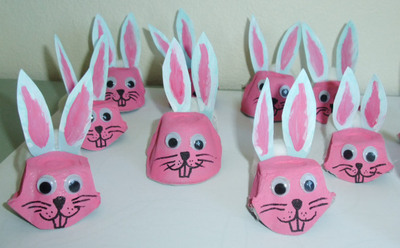 This is an easy way to make little rabbits to decorate your home & garden over Easter. Paint your egg carton with acrylic paint and leave to dry. Cut out individual carton pieces. 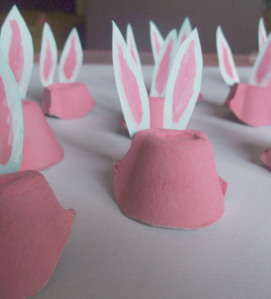 On a piece of cardboard or firm paper, draw and paint in rabbit ears, then glue to carton pieces. Glue on googlie eyes and draw on happy rabbit face. 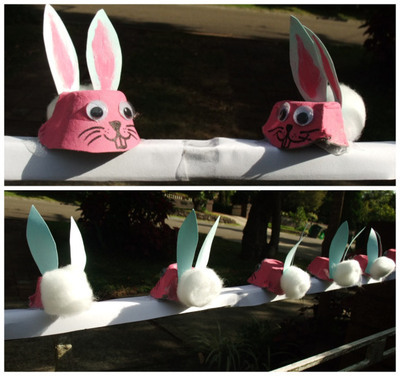 Glue cotton buds to the back of bunnies and pop them onto your front gate. Meet & greet Easter bunnies.